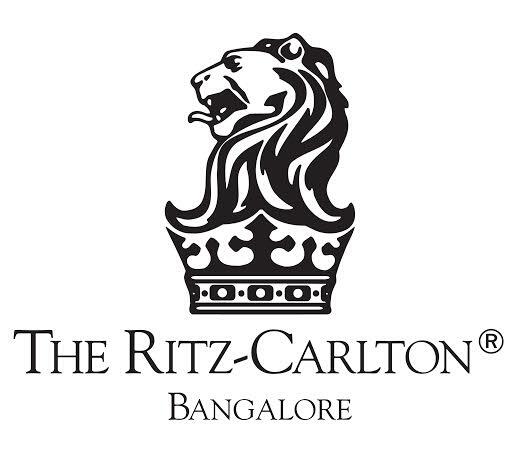 I had visited the Ritz Carlton, Bengaluru in December to speak on wines to a group of finance professionals. From the main porch till the banquet I was greeted by my name thrice and that is when I thought to myself, this must be the trailer of the ‘Ritz Carlton experience’. I walked around the property and knew I had to come back and experience it in totality. 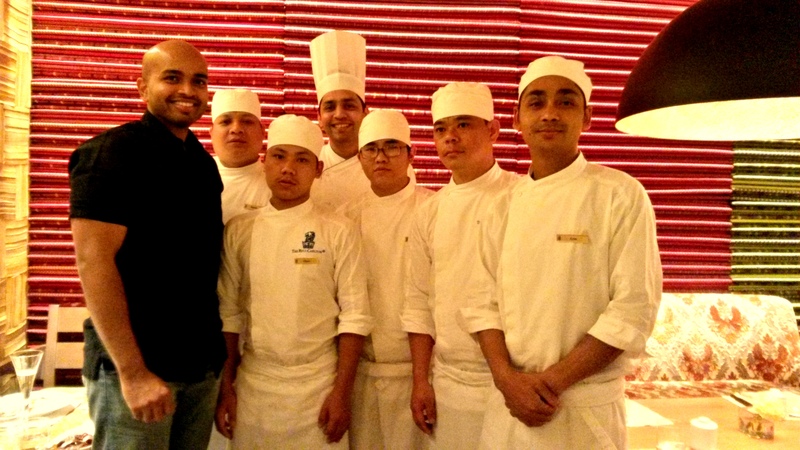 It was the 31st of January, the Chinese New year of the horse and I was travelling to Bangalore for work, couldn’t have been more opportune than this date to visit ‘Lantern’ their Chinese restaurant. I headed to the restaurant for dinner; directly from the airport. As I waited for my guest in the lobby, I happened to meet Nilesh Singh – EAM (Food and beverage) of the hotel and he was kind enough to walk me around the hotel, Enotecas in every restaurant to bolster the thriving wine culture in Bengaluru, an interactive Indian kitchen at the ‘Rivaz’ their Indian specialty were the highlights. We finally reached the Lantern and trust me, I waiting to be bowled over. Lantern is split over 3 levels, on the 3rd level is a high energy bar , 2nd level a bit ‘loungey’ for pre-dinner drinks and on the first its cozy eating place with an outdoor seating. And yes this is a fine diner which is open from noon to midnight. We ordered a bottle of bubbly as suggested by the server, a bottle of Il Grigio, thought it to be an aromatic prosecco but was a chardonnay blend from Italy. Soon arrived Sidney Dcunha head chef of the Lantern with a plateful of ingredients for the Yusheng (Prosperity toss) a New Year affair where family members toss-up a salad and the higher they toss the more abundant their year would be, it is raw fish traditionally but we had the vegetable version of the same. Dimsums (steamed/baked/fried), Cheung Fun, soups, main course (Stir fry and gravies), rice/noodles and desserts were the food options along with a selection of some floral/Chinese teas to accompany; we stuck to the sparkling during our meal. Vegetable and Chive dumpling: Steamed in wheat starch and served with a burnt chilli and garlic sauce, you can’t stop at just one. 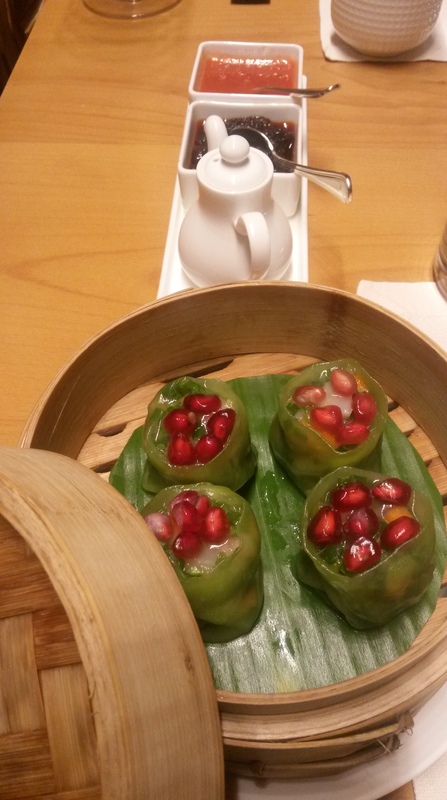 Shimeji Dumplings: Shimeji is a type of mushrooms, and the flavors in the dimsum just got enhanced with a dash of soy. The coating was very even, almost translucent with no lumps on the edges. 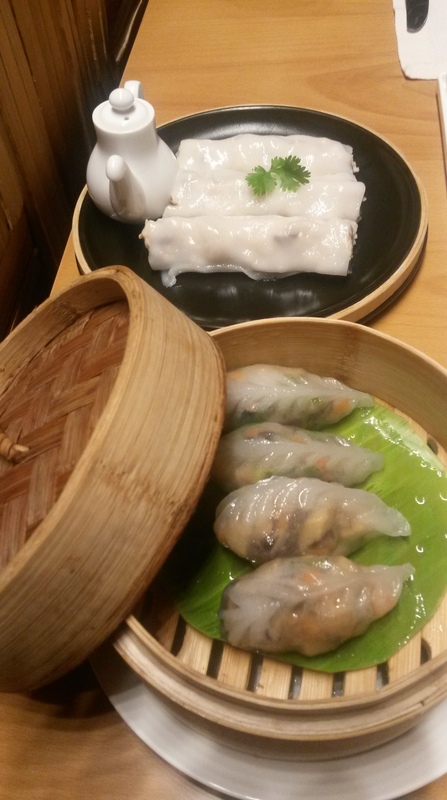 Vegetable Cheung fun: Steamed rice rolls with vegetable. Very delicately rolled, soft and moist they were served with soy. Mapo Tofu: Mapo literally means “Old woman with a pockmarked face “, this dish got famous in Sichuan province in a restaurant run by an old lady with a spotted face. Tofu cooked in black bean is the original with variations of beef and pork appear on menus these days. Stir fried Chinese greens: Snow peas, asparagus and seasonal veggies tossed in a subtle garlic sauce. Hofan noodles Freshly made flat and broad rice noodles, extremely tender and tossed with veggies. You cannot miss this one for sure. 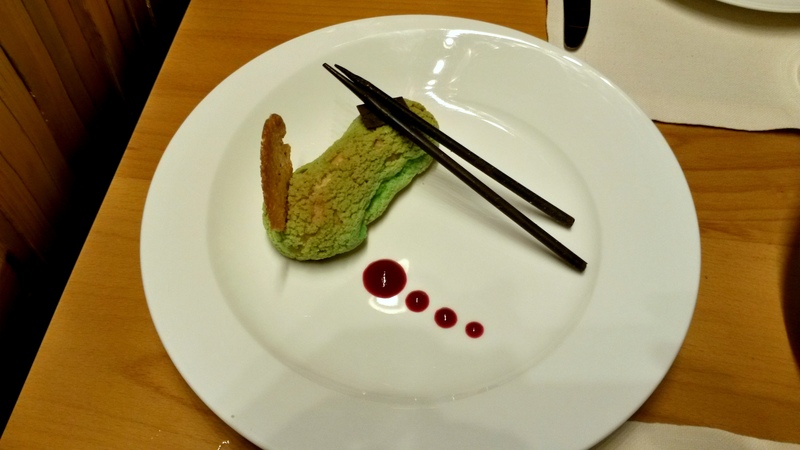 Jasmine and green tea Éclairs: After the dose of spice, this dish came as a refresher. Choux pastry filled with a jasmine and Green tea flavoured Crème anglaise (custard). I skip éclairs on every given occasion but I don’t mind returning for more of these. Must have!!! Chocolate and five spice pastry: This was very commonplace with chocolate masking the spice, can give it a miss. 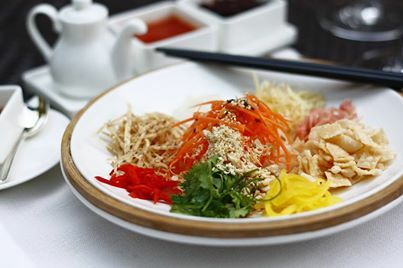 Food: Traditional Chinese with contemporary presentations and a classic taste, this eatery is open throughout the day( 12 to 12). Loved the food…was a point of discussion even as we tucked in ghee smeared dosas at one of the Shanti Sagars the next day. Service: Knowledgeable and engaging. 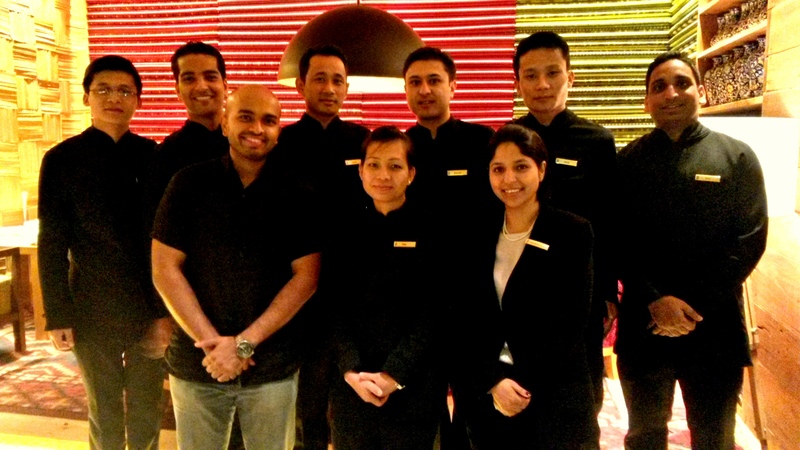 Shatakshi Sood and her team seem to be doing a great job, on that evening for sure as we also overheard other guests complimenting them on service. We ordered a little more in haste, but a meal for two comes under 2-2.5k and is great value for money considering the overall experience. 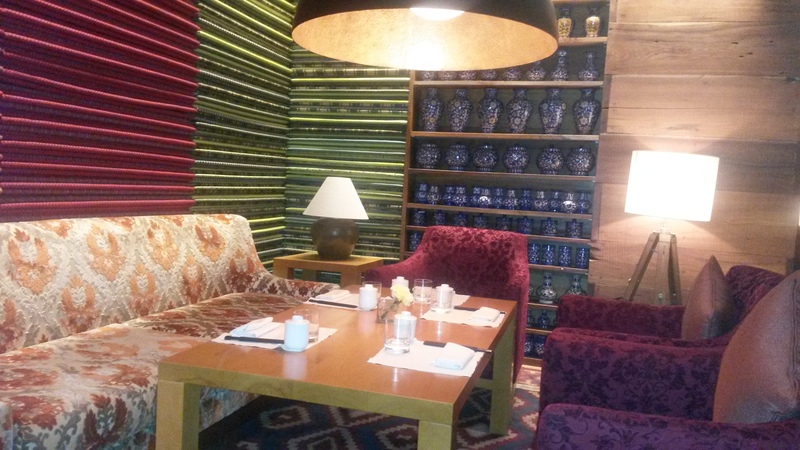 P.S: Next on my list is the afternoon tea at the Lobby lounge and a meal at the Rivaz. 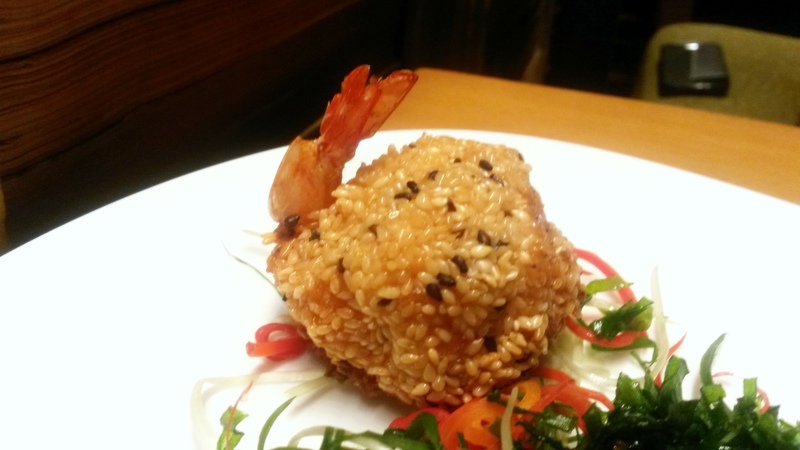 Read about Indian wine and food pairing exercise by the Food Lovers Magazine at the Rivaz here. Nice review of The Lantern. I would however like to report on one factual error though: The tail of your article mentions an “Indian wine and food pairing exercise by the Bangalore wine club at the Rivaz”. Please note this table on Indian Food & Wine pairing at Riwaz was conducted and curated by Food Lovers magazine for an article on ‘Pairing North Indian Food with Wine” that appeared subsequently. Click here (http://tinyurl.com/qf6emct) for a FB link to the relevant album on Food Lovers magazine. The author of the blog that your article is linked to, Ruma Singh, was a guest at the table as she has also acknowledged in her blog. Our article on ‘Pairing North Indian Food with Wine” is part of a regular series at Food Lovers magazine to break the myth that Indian Food cannot pair well with wine. I would appreciate if you could acknowledge this letter and correct the error on this page, would also be nice if you could also provide a link to the above-mentioned album on FB for the benefit of your readers. Thanks for visiting my blog,am glad you liked it. I am indeed sorry for the lapse in diligence for the error you pointed out. I have corrected it now and included the link too. Also congratulations on your efforts to attempt and popularize Indian food and wine through your publication. Thank you for your prompt response and edit on this one, appreciate it. Thank you for posting the link to the Food Lovers mag on FB too.